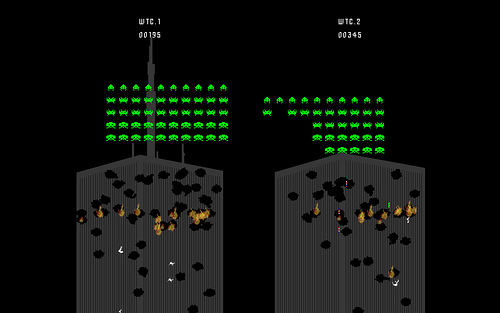 Douglas Stanley talks to us about his piece, Invaders!, and the creative environment that produced it. Trevor Owens of playthepast.org discusses collecting evidence as a digital historian in Fallout 3. Marty Kraham (AKA TV Death Squad) tells the story behind the notorious video of his performance at the 2009 Game Core convention. The music in the first segment is “Like Analogue” by Monoiz and is available here. Intro, outro, and transition music as well as the music in the second segment is by DJ Funken Wagnalls. The music in the third segment is “Puncture the Skyline” by TV Death Squad and is available here.